You are currently browsing the category archive for the ‘Skunk Cabbage’ category. Sorry I haven’t written a new blog entry for a while. Last time I was in a bad mood over the long winter, now I’ve been busy with Spring. Maria, my youngest daughter is graduating from college and preparing to start graduate school this fall. We attended her thesis presentation and she was as her professor said, ‘perfect.’ Aurora and I are enjoying our membership in First Parish Church United in Westford. Lad is going to turn 15 next month, he has the wise old dog look as if he is seeing into the world of mystery and spirit. My Grandchildren are growing up — Jack has a new job, Eddy is teaching Freshman English and doing well in graduate school, Shaylyn is thinking of going to college on the East Coast — yeah!! — and Elliot is growing up and enjoying his new school (how I miss them all!) Shay paid us a visit in April and it was such a treat. She is so delightful to be with and I think she had a good time as well. Visited RISD and some art schools in Boston. I hope she picks one next year. Meanwhile politics, local and national, marches on in its surrealistic way. Extremists abound. Mean spirits continue to rule and the rest of us rue the day. Yet our problems are not petty nor mean. They are the result of our success as a species. Its pretty clear that what is needed is for us to grow up and quickly. It is human nature itself that is challenged and needs to evolve — with great rapidity – if that’s possible. While I feel very good — liberated — about the Baha’i decision, I think it a shame the Baha’i faith hasn’t had greater impact. Some of what the Bahia’s teach is good medicine. But its such a stew of mixed and contradictory beliefs and behaviors that in good conscience I can’t call myself a Baha’i. Greater impact would stir some of the questions that need asking now — I don’t hold hope that Baha’i has all the answers but questions? Yes it offers many. For me the problem with religion is that most of ’em claim to offer the infallible word of God. If you need to know what to do and you are religious you can look it up in the holy book. Of course this breaks down at times (often) and then the believers need to come up with logic that explains away the contradictions, logical fallacies, and misinformation. I think that only if we keep things simple — the golden rule, the four noble truths, “Love one another as I have loved you” — there is hope. Most faiths act as if they had the only or ultimate truth. Baha’i says — all religious are true but ours is truer because its the latest revelation from God. Seems simple — but its a dangerous and divisive attitude. The concept that God progressively reveals more truth over time to meet the needs of each age seems simple too. But its simplicity precludes the problem solving and truth finding that we need to do in our lives as we follow our own unique path. This is what drew me to the church we recently joined. It is affiliated with Unitarian/Universalist and through them with the teachings of Ralph Waldo Emerson. I get much wisdom and pleasure from his writings. His advice is to listen to one’s inner voice, to intuition. He advises us to not seek the truth in books but in our own ‘genius’ — that is the spirit within. A kind of contradiction because I am seeking wisdom in books of his. At least Emerson doesn’t claim to be the voice of God! 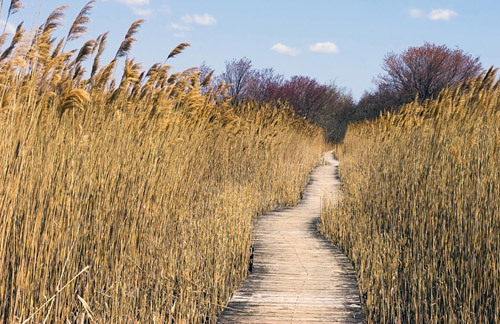 The UU approach implies that truth can be found in many places, sacred and secular. I think this is good advice. Also the rejection of the belief that certain historic figures were unique and were incarnations or direct voices of God is good. As Emerson taught, the same source of truth that Christ had we may have as well. Christ set an example of how to find that source and we would do well to emulate it. But to worship him as God or nearly God or God’s only son is rejected. I agree. And I also reject the infallibility of Baha’ullah and the others in Baha’i who claim it because no one born of flesh was ever infallible. Worth following? Possibly. Infallible? Not possible. I hope to write in this blog more often. 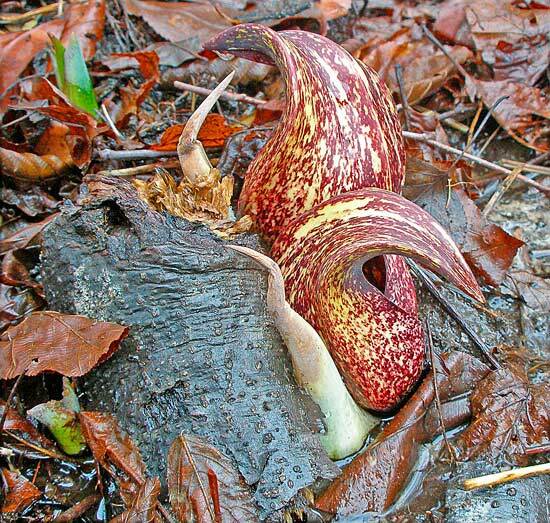 I’ll get back to being more specific and reporting events that might interest others — like apparently skunk cabbage — one of my readers (or I guess searchers/googlers) most favored subjects strangely enough. Meanwhile enjoy the springtime and let me know your thoughts if you want. Last night was particularly beautiful but I was caught without a camera. The sky just after sunset was slate gray, dark blue an silver-gray, in the west was fire. The waxing crescent moon was high having risen in the afternoon. There was enough light for the trees along the powerline access path to glow. As I walked Lad down the trail an owl hooted off in the distance near Nutting Road. I wanted to capture this beauty in a huge square formated photo. I’ve added the skunk cabbage photo for the benefit of those who are looking for pictures of skunk cabbage — I seem to get hits almost every day looking for that because of my post earlier this moth about the skunk cabbage in January. The photo above is from a day in March a couple of years ago. 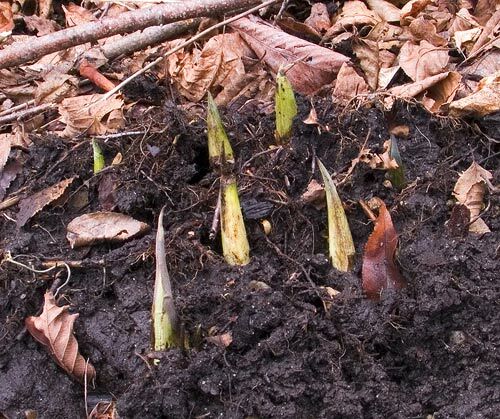 A more normal skunk cabbage appearance. Here is a photo of something that is not normal. 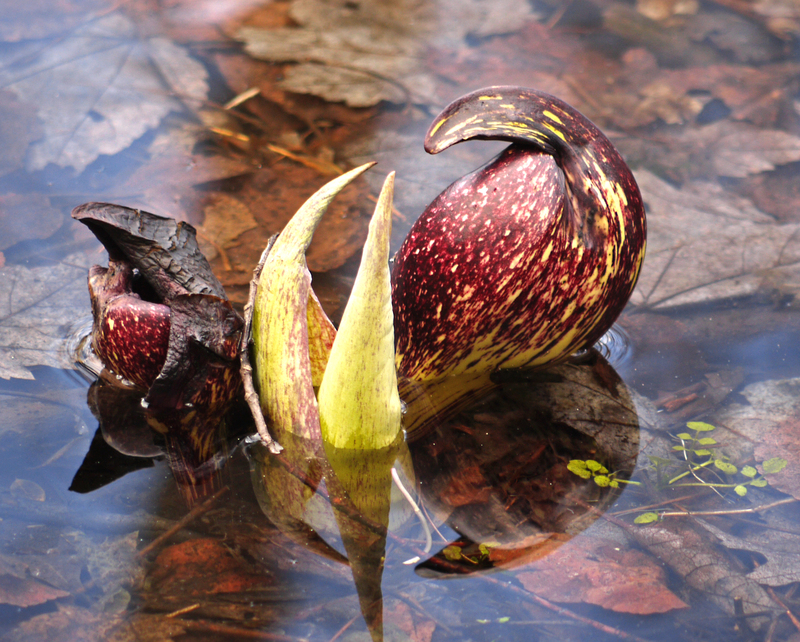 Skunk cabbage is the first sign of life in the woods, in swampy, wet areas — in the early spring or late winter. March not January 5th when this was taken.